Mahindra & Mahindra, the Indian auto major launched its flagship hatchback Mahindra Verito Vibe in the Indian car market. This is the sub 4 meter length hatchback version comes with the design cues extracted from the Verito sedan. This hatchback is launched with just diesel engine option unlike its sibling, which is available in both petrol and diesel engine options. This is the first time that M&M has launched the hatchback version in the automobile bazaar. 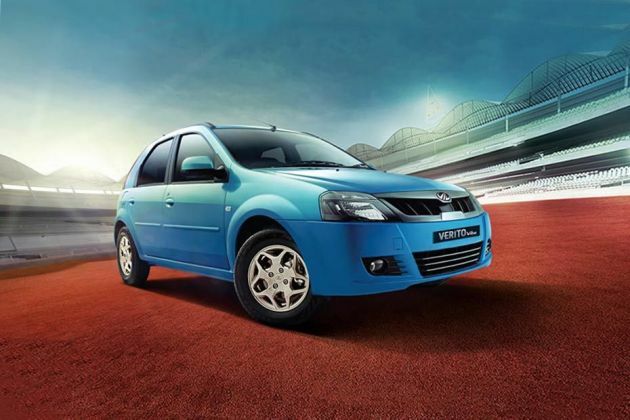 The company claims that the Vibe hatch can deliver a class leading mileage of about 20.8 Kmpl. The mileage is certified by ARAI. The company seems to have launched the vehicle at the right time as the demand for diesel vehicles is growing in the country. The all new Mahindra Verito Vibe D2 is the base version in the lineup and it is launched at a very competitive price, which will allow it to compete with other hatchback models in its segment. The all new Mahindra Verito Vibe is a sibling of Verito Sedan and its front fascia is much identical to the Verito Sedan. When it comes to the front facade the base version, Mahindra Verito Vibe 1.5 dCi D2 has got Matte Black colored front radiator grille along with prominent company logo affixed on it. It has got an eyebrow shaped head lamp cluster, integrated with indicator lamps. While the body colored bumper integrated with air dam adds more style and elegance to this hatchback. However, there are no fog lamps given to this vehicle. There is a 2-speed + intermittent windshield wiper offered with this vehicle , which will be helpful to give clear vision during heavy rain condition. If it comes to the side profile, the car has got a set of 14 inch steel rims equipped with tubeless tyres of size 185/70 R14. There are few other exterior features such as roof rails, side view mirrors, wheel covers, and so on that makes the Verito Vibe to look decent. If it comes to the rear end, the car has got LED tail lamps, while the rear applique given in black color. The entire rear end design of this car is completely different and very unusual compared to other hatchbacks of its class. The interiors of the Mahindra Verito Vibe 1.5 dCi D2 trim comes with Woven Jacquard colored premium fabric upholstery, which makes the interiors plush. There is a storage space provided in the central console where you can store some important documents. This entry level trim is a spacious hatchback that can accommodate five people inside, while offering some of the best in class comfort and convenience features. The company claims that the seats are pretty wide that makes it very comfortable for the occupants inside the car. The central fascia is offered in molded black in color, while the sporty gear shift knob is offered in black. There is no vanity mirror and cup holders offered in this entry level hatch. Apart from these, the luggage compartment has been offered with a full carpet. The all new Vibe hatchback is launched with diesel engine option only. It is blessed with a 1.5-litre 4-cylinder, 8-valve, dCi CRDi diesel engine displacing at 1461cc . This superior engine has the ability to churn out a peak power of about 64.1bhp at 4000rpm and makes a torque of about 160Nm at 2000rpm, which is rather good. This vehicle has the top speed of 144 Kmph and it can accelerate from 0-100 Kmph speed in 18.4 seconds from a standstill. This diesel mill has been paired with a 5 speed manual transmission gearbox that transmits the power through front wheels and enables the vehicle to deliver a superior mileage of about 20.8Kmpl, which is impressive. When it comes to the most important braking and handling part, the company has fitted this new hatchback with a robust suspension system. The suspension of the front wheel is a McPherson type wish bone link and the rear wheel is equipped with an H-Section torsion bean, which is also programed with deflection coil spring. This will take care of all the sudden jerks caused to the car. It has been further equipped with a superior braking system, which works very effectively in all weather conditions. The front wheels have been equipped with disc brakes and the rear end being equipped with drum brakes . Handling this car will be very easy as it is being offered with a responsive power steering. Safety and security features are the most important features for any car, as they take the responsibility for the safety of the passengers inside. The all new Mahindra Verito Vibe D2 has been offered with some of the decent safety and security features such as a collapsible steering column, front seat belts, halogen head lamps for clear visibility, Anti-theft engine immobilizer that avoids unauthorized entry in to this hatchback, child proof rear door locks, prismatic day-night rear view mirror, laminated windshield and few others. There are few other important safety features includes a tachometer, front disc brakes for efficient braking, and a twin tone horn as well that enhances the safety and protection of the occupants inside. The company has launched the all new Mahindra Verito Vibe 1.5 dCi D2 with most of the basic and standard features. However, the features inside this entry level variant are not-so-impressive compared to the features inside its top end variant. This spacious hatchback has been equipped with some of the features like air conditioner along with cabin heater, adjustable head restraints, front door map pocket, power steering, fabric upholstery , LCD display on instrument cluster that provides details regarding total mileage, fuel gauge, digital clock and temperature. This new hatchback from M&M is offered with 3 years or 1,00,000 kilometers warranty. This vehicle suits aptly for the Indian roads and traffic conditions and the lavish seating inside the car will never let you to experience any discomfort on the go. Pros : Huge interior space, reliable engine, attractive front fascia. Cons : More features could be added, price can be made more competitive, interior plastics is cheap. Mahindra Verito Vibe is available in 7 different colours - Aqua Rush, Mist Silver, Diamond White, Fiery Black, Dolphin Grey, Java Brown, Toreador Red. Mahindra Verito Vibe is an excellent car. And the features are more than Vitara Breeza and Creta. If you want to buy a new car then just go for it. Having smooth driving, so nice, it is so cool. I love this car very much. Good to have this one in the family. We got the car 5 year back and still the car is it's best conditions and with best mileage we got was about 22kmpl.